The specs we have on the e-Golf is an electric range of around 80 miles. Volkswagen says the electric Golf is good for 118 miles, but that’s on the more lenient NEDC test cycle, so 80 miles is the estimate on the US EPA test cycle. 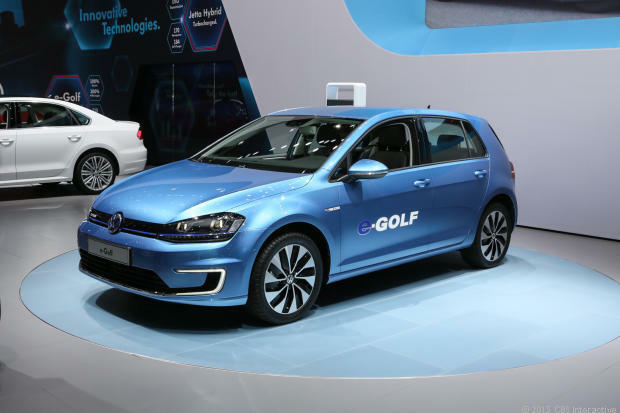 Charging the Golf electric vehicle will take around 13 hours on a 120-volt plug, and 4 hours using an optional wall-box charger. The electric motor in the Golf is rated at 114 horsepower, and has 199lb-ft – almost 200 lb-ft of torque! Acceleration is listed as 10.4 seconds to get to 60 mph. Volkswagen again reiterated that the e-Golf is set to go on sale in the fourth quarter of 2014 as a 2015 model. In Europe, they get it sooner – sometime in Spring 2014.